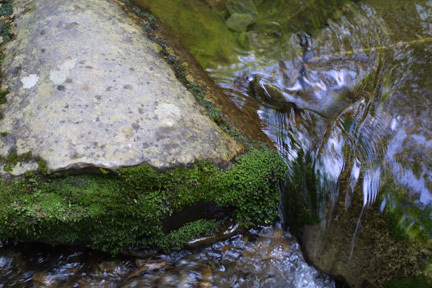 Liverworts are found in very moist habitats, such as along rocky streams. 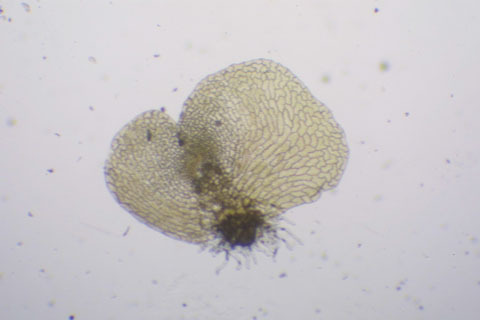 Some species of liverworts can reproduce asexually through gemmi, which form in cup shaped structures on the gametophytes. Polytrichum juniperinum (juniper polytrichum moss). 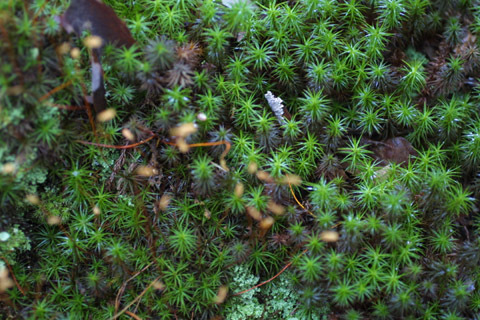 The green, leafy gametophyte is the familiar "moss" we see in moist environments. It has no vascular system and therefore cannot grow higher than a few cm. 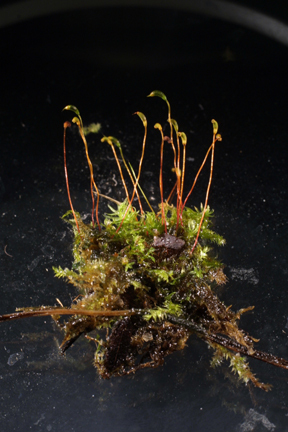 The sporophyte grows from its top of its parental gametophyte and is dependent on it for nutrition. 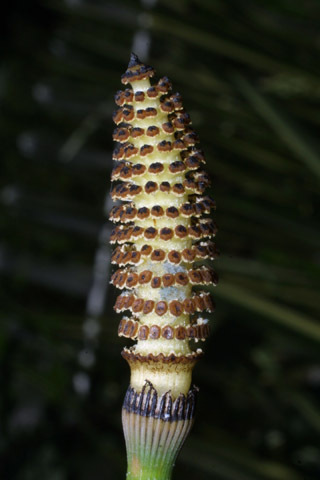 The capsule atop the long stalk contains spores. 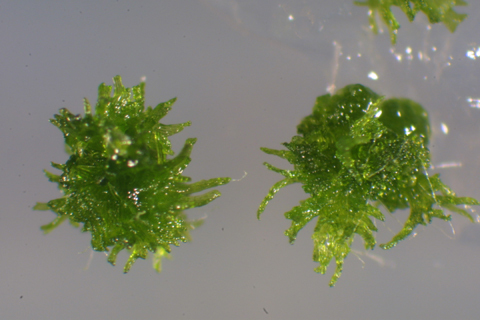 The non-photosynthetic gametophyte lives underground and derives nutrition from mycorrhizal fungi. 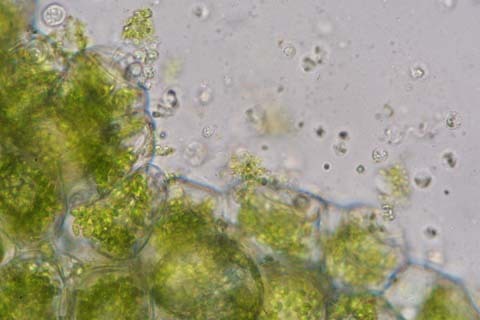 Microscopic view of gametophyte. 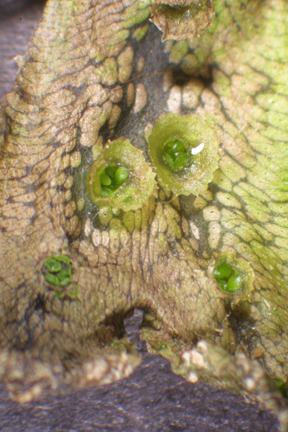 The protrusions on the surface are gemmae, antheridia, and archegonia. 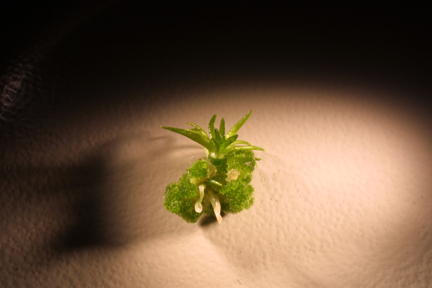 Image of plants collected from soil. 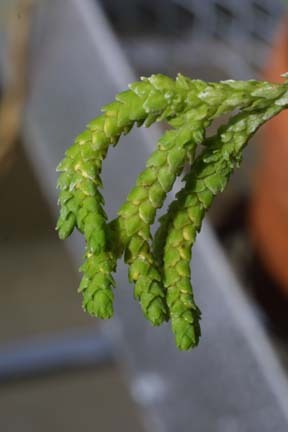 The horizontal plant with bumps (antheridia) is the gametophyte. 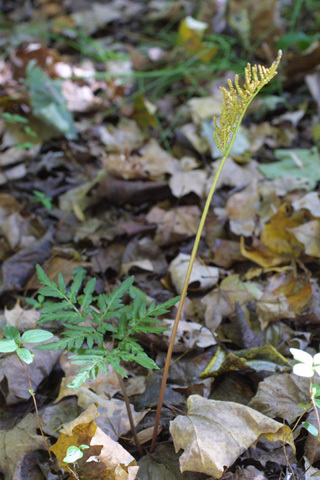 The y-shaped plant behind it is the developing rhyzome of a very young sporophyte offspring of the gametophyte. 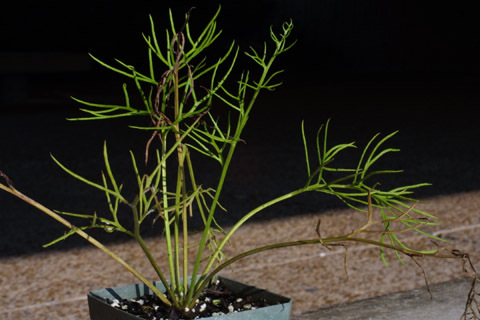 The sporophyte is one of the simplest vascular plants and has no roots. 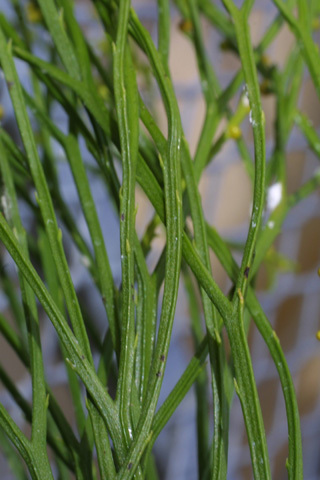 Psilotum has tiny scales for leaves. The sporangia are located in the upper part of the stems. 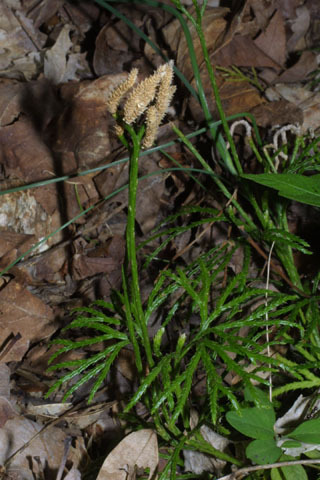 Lycopodiella alopecuroides (foxtail clubmoss) - This gametophyte is photosynthetic, but only a few mm in size. 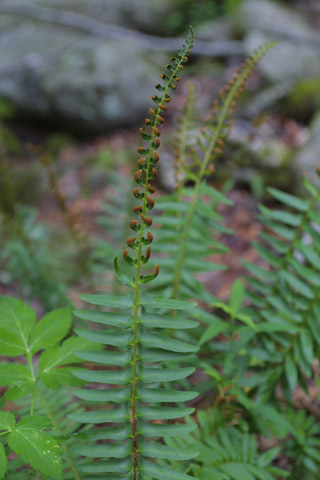 The sporophyte is beginning to develop out of the gametophyte of this Lycopodium sp. 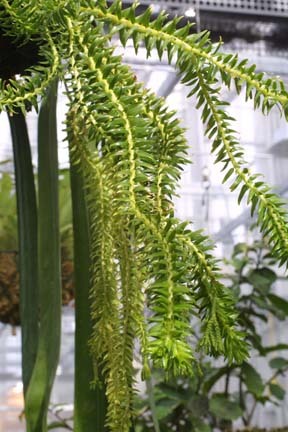 Lycopodium digitatum (fan clubmoss) - Clubmoss sporophytes are among the simplest vascular plants. Lycopodium digitatum (fan clubmoss) - In some species, sporangia are located in strobili (cones) at the tips of the leafy stems, or at the top of long stalks (hence the name "club"). "Cones" containing sproangia. 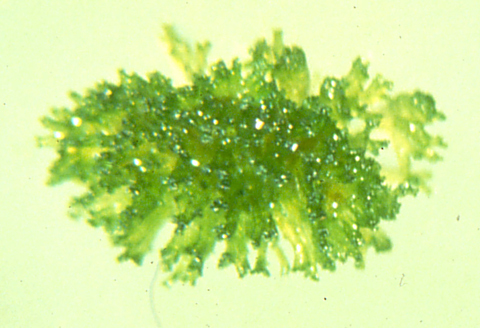 Selaginella produces two different types of spores: megaspores that develop into female gametophytes and microspores that develop into male gametophytes. 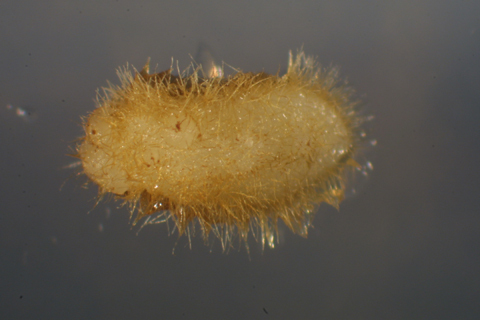 The gametophytes may begin development within the cone before they are shot violently out of the cone to begin an independent existance. 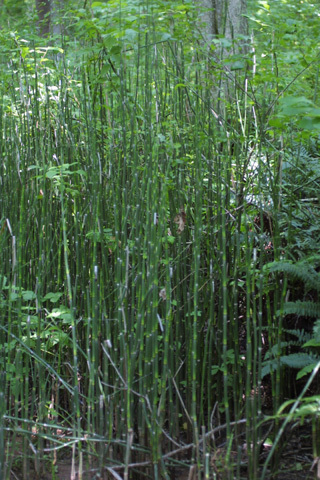 The Equisetum gametophyte is small (about 4 mm long) and photosynthetic. 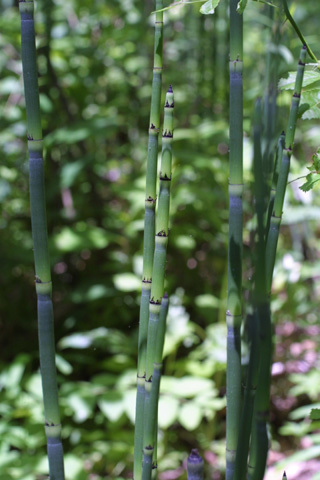 Equisetum sporophytes may be found in wet areas. 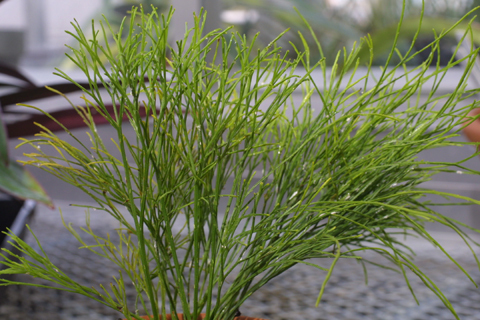 Silica in the tough stems makes them suitable for scrubbing pots - hence the name "scouring rush". 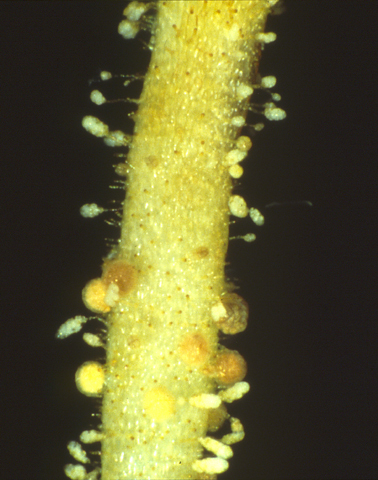 Spore-bearing stroboli (cones) are located at the top of the stems. 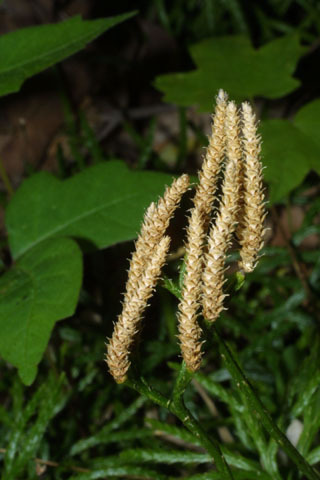 Leaves in this species are small and arranged in whorls around the stem. Most photosynthesis occurs in the stem. 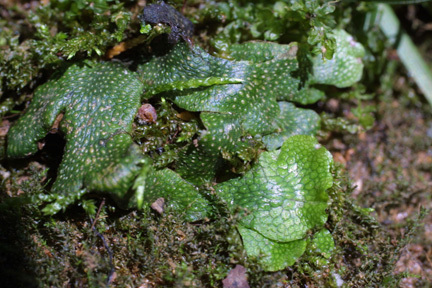 The gametophyte is tiny (a few mm long) and non-photosynthetic. 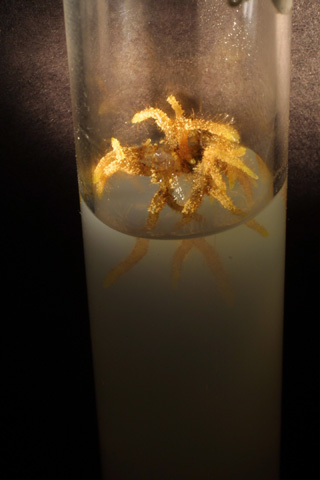 It lives underground and is parasitic on mycorrhizal fungi. 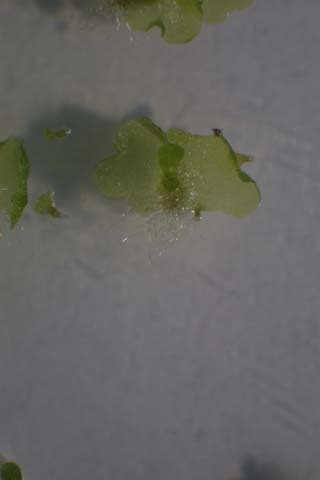 Here is another non-photosynthetic gametophyte, and another. The sporophyte has photosynthetic leaves. 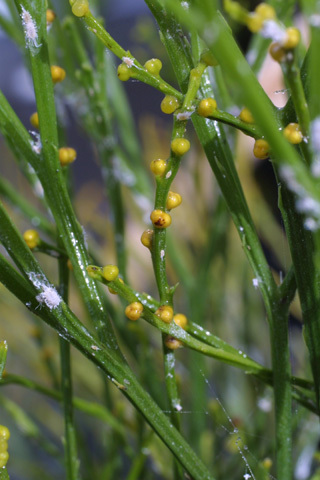 Sporangia are borne on a spike that rises above the plant. 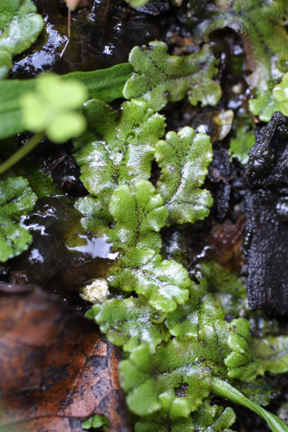 Ceratopteris richardii (triangle waterfern). 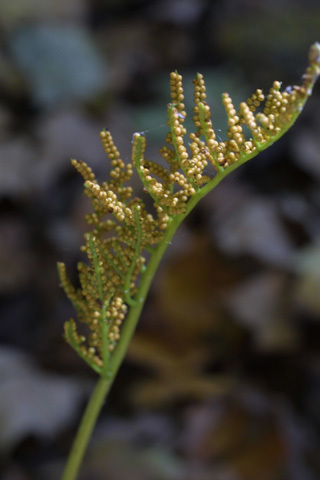 Spores commercially available as "C-ferns". 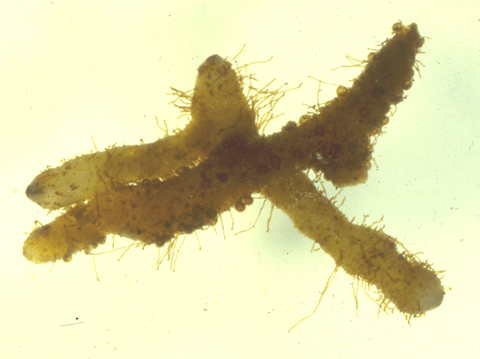 C. richardii produces two sexes of gametophytes. This is a microscopic view of a hermaphrodyte (having both male and female reproductive structures). 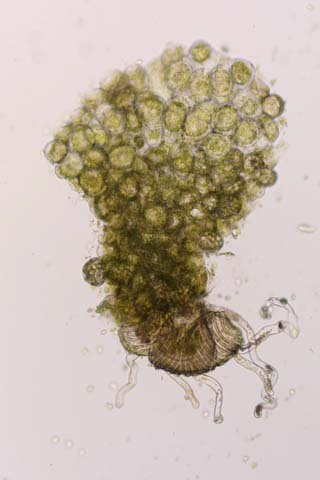 This is a male at higher magnification, showing sperm (corkscrew-shaped) that have been released when the gametophyte was exposed to water. 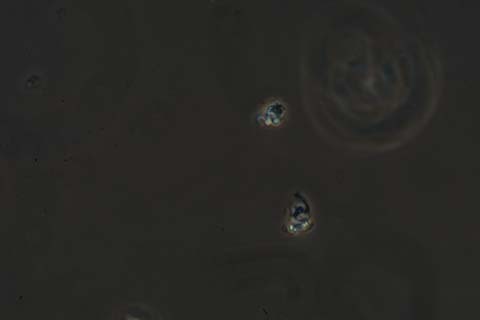 Closeup of sperm under phase contrast. After fertilization, the zygote develops into a sporophyte which grows on top of the gametophyte. The developing sporophyte is seen here as a small green "tongue" growing in the middle of the hermaphrodyte. This is the full-grown sporophyte. 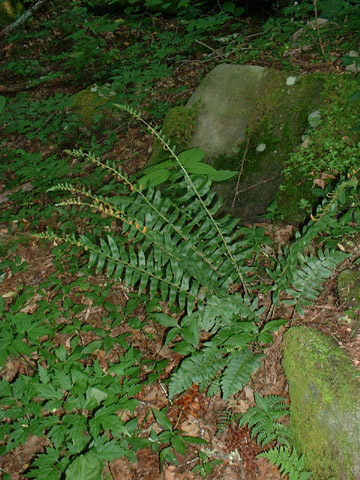 P. acrostichoides is a common woodland fern. 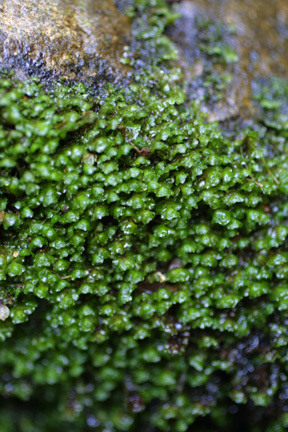 Sporangia are borne on special pinnae at the top of the frond. 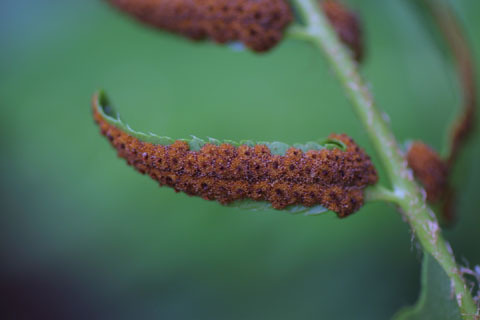 Closeup of sporangia on lower surface of leaf.